Prolific young Waikato Stud stallion Ocean Park is continuing where he left off in December with another impressive week. The former New Zealand Horse of the Year has sired eight winners in the last seven days and is showing no signs of letting up. The progeny of Ocean Park, whose winning tally last month was an impressive 15 across Australasia and Asia, are on fire. It’s been both an impressive and superbly timed run with the imminent opening of the New Zealand Bloodstock’s National Yearling Sale. Waikato Stud will offer 20 of Ocean Park’s sons and daughters in their Book 1 draft at Karaka in their pursuit of a sixth consecutive champion vendor title. Leading the stallion’s most recent flurry of winners is Mick Price’s gifted filly Oceanex, who completed a hat-trick on Saturday. Her Flemington victory has convinced Price to set her for the Gr.1 Vinery Stud Stakes and the Gr.1 ATC Oaks in Sydney in the autumn. Oceanex’s stablematre Senrima Tide wasn’t to be outdone with her Sandown success the second of her five-start career. Another smart four-year-old in Australia is Holbrook, who triumphed at the Gold Coast for the third win from his last four starts. Tatalina also kept the Australian clock ticking over when she scored in style at Calundra in just her second outing. Clement Legend, meanwhile, is continuing his impressive march through the Singapore grades and his Happy Valley victory was his fourth on the bounce. At home, Roger James and Robert Wellwood have long regarded Rondinella of stakes winning ability and she’ll get her chance in the near future. 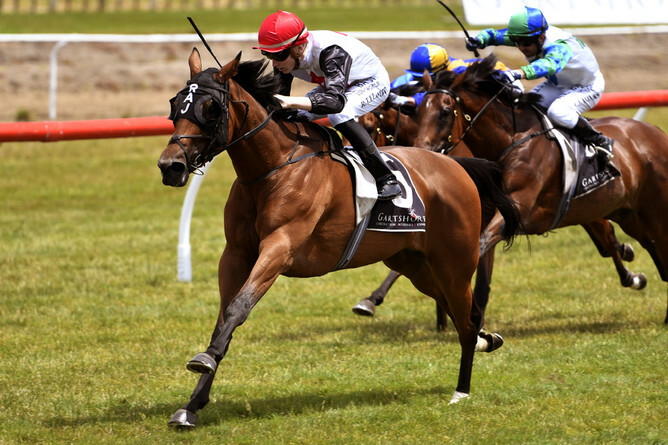 She stepped up to a middle distance at Tauranga and duly posted the third win of her eight-start career with plenty more in store. Allan Sharrock also took the covers off a talented filly at New Plymouth where Our Hail Mary won at the first time of asking. The run continued this afternoon at Te Rapa where Ocean Go produced a sustained finishing bid to break his maiden at his third outing.